In the Jamestown District on Golden Hill was once located the Golden Age Mine. 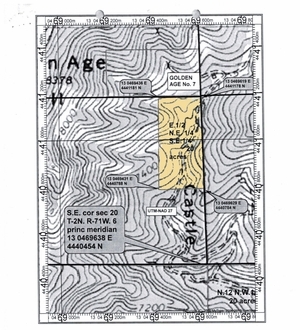 According to Lovering and Goddard in their 1951 Professional Paper 223, "The Golden Age mine has been the leading source of free gold and pyritic gold ore in the district and is famous in Boulder County for its extremely rich specimens of free gold." They also go on to write that the "free gold...was brighty yellow and embedded in white quartz and ranged in size from coarse grains to nuggets weighing several ounces."